Motion, the process of movement, is described using specific anatomical terms. Motion includes movement of organs, joints, limbs, and specific sections of the body. The terminology used describes this motion according to its direction relative to the anatomical position of the joints. Anatomists use a unified set of terms to describe most of the movements, although other, more specialized terms are necessary for describing the uniqueness of the movements such as those of the hands, feet, and eyes. In general, motion is classified according to the anatomical plane it occurs in. Flexion and extension are examples of angular motions, in which two axes of a joint are brought closer together or moved further apart. Rotational motion may occur at other joints, for example the shoulder, and are described as internal or external. Other terms, such as elevation and depression, refer to movement above or below the horizontal plane. Many anatomical terms derive from Latin terms with the same meaning. Gliding motions occur between flat surfaces, such as in the intervertebral discs or between the carpal and metacarpal bones of the hand. Angular motions occur over synovial joints and causes them to either increase or decrease angles between bones. Rotational motions move a structure in a rotational motion along a longitudinal axis, such as turning the head to look to either side. Linear motions (or translatory motions), which move in a line between two points. A rectilinear motion refers to a motion in a straight line between two points, whereas a curvilinear motion refers to a motion following a curved path. Angular motions (or rotary motions) occur when an object is around another object increasing or decreasing the angle. The different parts of the object do not move the same distance. Examples include a movement of the knee, where the lower leg changes angle compared to the femur, or movements of the ankle. The study of movement is known as kinesiology. A categoric list of movements of the human body and the muscles involved can be found at list of movements of the human body. 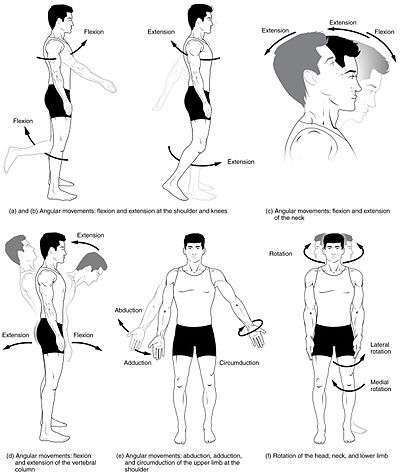 These are general terms that can be used to describe most movements the body makes. Most terms have a clear opposite, and so are treated in pairs. Flexion describes a bending movement that decreases the angle between a segment and its proximal segment. For example, bending the elbow, or clenching a hand into a fist, are examples of flexion. When sitting down, the knees are flexed. When a joint can move forward and backward, such as the neck and trunk, flexion refers to movement in the anterior direction. Flexion of the shoulder or hip refers to movement of the arm or leg forward. Abduction refers to a motion that pulls a structure or part away from the midline of the body. In the case of fingers and toes, it refers to spreading the digits apart, away from the centerline of the hand or foot. Abduction of the wrist is also called radial deviation. For example, raising the arms up, such as when tightrope-walking, is an example of abduction at the shoulder. When the legs are splayed at the hip, such as when doing a star jump or doing a split, the legs are abducted at the hip. Adduction refers to a motion that pulls a structure or part toward the midline of the body, or towards the midline of a limb. In the case of fingers and toes, it refers to bringing the digits together, towards the centerline of the hand or foot. Adduction of the wrist is also called ulnar deviation. Dropping the arms to the sides, or bringing the knees together, are examples of adduction. Depression refers to movement in an inferior direction, the opposite of elevation. Rotation of body parts is referred to as internal or external, referring to rotation towards or away from the center of the body. Internal rotation (or medial rotation) refers to rotation towards the axis of the body. External rotation (or lateral rotation) refers to rotation away from the center of the body. 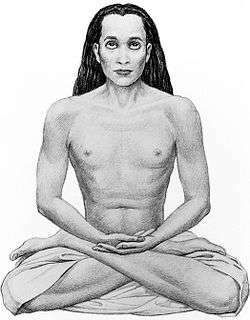 The lotus position of yoga, demonstrating external rotation of the leg at the hip. Rotating the arm away from the body is external rotation. Rotating the arm closer to the body is internal rotation. Anterograde and Retrograde flow, refers to movement of blood or other fluids in a normal (anterograde) or abnormal (retrograde) direction. Reduction refers to a motion returning a bone to its original state, such as a shoulder reduction following shoulder dislocation, or reduction of a hernia. Dorsiflexion where the toes are brought closer to the shin. This decreases the angle between the dorsum of the foot and the leg. For example, when walking on the heels the ankle is described as being in dorsiflexion. Plantar flexion is the movement which decreases the angle between the sole of the foot and the back of the leg. For example, the movement when depressing a car pedal or standing on the tiptoes can be described as plantar flexion. A ballerina, demonstrating plantar flexion of the feet. 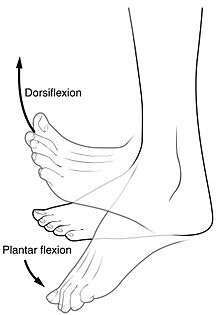 Dorsi and plantar flexion of the foot. Palmarflexion and dorsiflexion refer to movement of the flexion (palmarflexion) or extension (dorsiflexion) of the hand at the wrist. These terms refer to flexion between the hand and the body's dorsal surface, which is the back of the arm, and flexion between the hand and the body's plantar surface, which in anatomical position is considered the anterior side of the arm. The direction of terms are opposite to those in the foot because of embryological rotation of the limbs in opposite directions. Palmarflexion refers to decreasing the angle between the palm and the anterior forearm. Dorsiflexion refers to extension at the ankle or wrist joint. This brings the hand closer to the dorsum of the body. 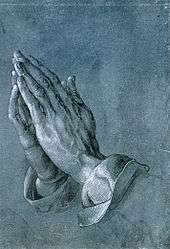 Praying Hands by Albrecht Dürer, demonstrating dorsiflexion of the hands. Pronation (/proʊˈneɪʃən/) and supination (/suːpᵻˈneɪʃən/) refer most generally to assuming prone or supine positions, but often they are used in a specific sense referring to rotation of the forearm or foot so that in the standard anatomical position the palm or sole is facing anteriorly (supination) or posteriorly (pronation). Pronation at the forearm is a rotational movement where the hand and upper arm are turned inwards. Pronation of the foot refers to turning of the sole outwards, so that weight is borne on the medial part of the foot. Supination of the forearm occurs when the forearm or palm are rotated outwards. Supination of the foot refers to turning of the sole of the foot inwards, shifting weight to the lateral edge. Inversion and eversion refer to movements that tilt the sole of the foot away from (eversion) or towards (inversion) the midline of the body. Eversion is the movement of the sole of the foot away from the median plane. Inversion is the movement of the sole towards the median plane. For example, inversion describes the motion when an ankle is twisted. A version is an eye movement involving both eyes moving synchronously and symmetrically in the same direction. Torsion refers to eye movement that affects the vertical axis of the eye, such as the movement made when looking in to the nose. Occlusion refers to motion of the mandibula towards the maxilla making contact between the teeth. Protrusion and Retrusion are sometimes used to describe the anterior (protrusion) and posterior (retrusion) movement of the jaw. Examples showing protrusion and retrusion. Elevation and depression of the jaw. Nutation and counternutation[lower-alpha 4] refer to movement of the sacrum defined by the rotation of the promontory downwards and anteriorly, as with lumbar extension (nutation); or upwards and posteriorly, as with lumbar flexion (counternutation). Opposition refers to the movement that involves grasping of the thumb and fingers. Protraction and Retraction refer to an anterior (protraction) or posterior (retraction) movement, such as of the arm at the shoulders, although these terms have been criticised as non-specific. Reciprocal motion refers to alternating motions in opposing directions. Reposition refers to restoring an object to its natural condition. 1 2 3 Marieb 2010, p. 212. 1 2 3 Lippert 2011, pp. 6-7. 1 2 3 Kendall 2005, p. 57. ↑ Lippert 2011, pp. 1-7. ↑ Kendall 2005, p. G-4. ↑ Seeley 1998, p. 229. ↑ "Anatomy & Physiology". Openstax college at Connexions. Retrieved November 16, 2013. ↑ OED 1989, "flexion", "extension". 1 2 3 4 Kendall 2005, p. 56. 1 2 3 Cook 2012, pp. 180-193. 1 2 3 Swartz 2010, pp. 590–591. ↑ OED 1989, "adduction", "abduction", "abduct". ↑ Kendall 2005, p. 303. 1 2 3 Swartz 2010, pp. 590-1. ↑ OED 1989, "anterograde", "retrograde". ↑ Saladin 2010, p. 300. ↑ Kendall 2005, p. 304. ↑ OED 1989, "plantar flexion", "dorsiflexion". 1 2 3 Kendall 2005, p. 371. 1 2 Kyung 2005, p. 123. 1 2 3 Swartz 2010, pp. 591-593. ↑ OED 1989, "plantarflexion", "dorsiflexion". ↑ Swartz 2010, pp. 591–592. ↑ Swartz 2010, p. 591. ↑ Kyung 2005, p. 108. ↑ Taber 2001, "protrusion", "retrusion". ↑ Houglum 2012, p. 333. ↑ OED 1989, "protraction", "retraction". ↑ Kendall 2005, p. 302. Albert, Daniel (2012). Dorland's Illustrated Medical Dictionary. (32nd ed.). Philadelphia, PA: Saunders/Elsevier. ISBN 978-1416062578. Chung, Kyung Won (2005). Gross Anatomy (Board Review). Lippincott Williams & Wilkins. ISBN 0-7817-5309-0. Cook, Chad E. (2012). Orthopedic Manual Therapy: An Evidence Based Approach (2nd ed.). Upper Saddle River, NJ: Pearson Education. ISBN 978-0-13-802173-3. Houglum, Peggy A.; Bertoli, Dolores B. (2012). Brunnstrom's Clinical Kinesiology. F. A. Davis Company. ISBN 978-0-8036-2352-1. Kendall, Florence Peterson; [et al. ]; et al. (2005). Muscles : testing and function with posture and pain (5th ed.). Baltimore, MD: Lippincott Williams & Wilkins. ISBN 0-7817-4780-5. Lippert, Lynn S. (2011). Clinical Kinesiology and Anatomy (5th ed.). F. A. Davis Company. ISBN 978-0-8036-2363-7. Marieb, Elaine N.; Wilhelm, Patricia B.; Mallat, Jon (2010). Human Anatomy. Pearson. ISBN 978-0-321-61611-1. Saladin, Kenneth S. (2010). Anatomy & Physiology The Unity of Form and Function (5th ed.). McGraw Hill. ISBN 978-0077361358. Seeley, Rod R.; Stephens, Trent D.; Tate, Philip (1998). Anatomy & Physiology (4th ed.). WCB/McGraw-Hill. ISBN 0-697-41107-9. Simpson, John A.; Weiner, Edmung (1989). The Oxford English Dictionary. Oxford: Clarendon Press. ISBN 9780198611868. Swartz, Mark H. (2010). Textbook of Physical Diagnosis: History and Examination (6th ed.). Saunders/Elsevier. ISBN 978-1-4160-6203-5. Wikimedia Commons has media related to Anatomical terms of motion.